Record numbers of UK university places have been offered - as A-level results show a marginal fall in top grades for the fifth successive year. The proportion of A* and A grades was 25.8%, down by 0.1% on last year. The pass rate of 98.1% remained the same. The Ucas admissions services says 424,000 places have been offered, up by 3% on results day last year. There are predictions of many places still being available through clearing, including in leading universities. Universities say this year could be a "buyer's market" for applications with universities competing to attract students. As well as the removal of the cap on university places in England, there is a decline in the number of 18 year olds. There are more university places on offer through clearing this year. This is the process which matches students with available places, after results have been published. By this afternoon there had been more than 200,000 course searches on the Ucas website, with economics, law, psychology, business and nursing among the most popular courses. There also places available at some leading Russell Group universities, including Birmingham, Leeds, Manchester, Sheffield and Warwick. Oxford, Cambridge, Imperial UCL and LSE continue not to take part. Sheffield University says its clearing service took 1,800 calls in the first two hours, leading to 360 offers. "There's never been a better year to be applying to university in terms of your chances of getting a place, said Sheffield's head of admissions Lynsey Hopkins. 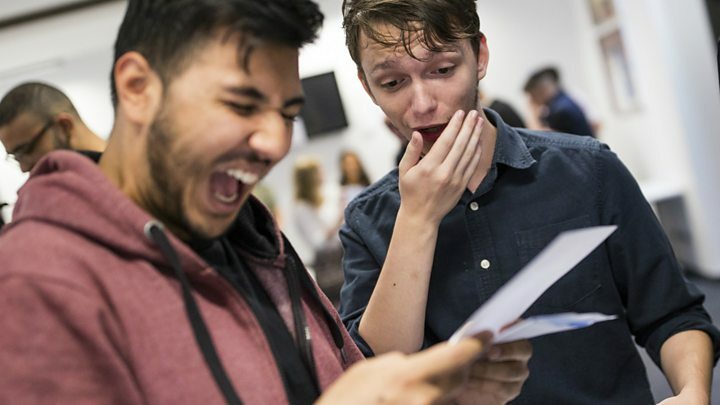 Hundreds of thousands of teenagers in England, Wales and Northern Ireland have found out their A-level and AS results on Thursday. Students in Scotland have already received their exam results. 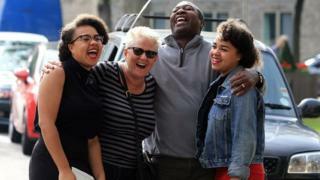 The A-level results show a stable pattern compared with last year. Michael Turner, director general of the Joint Council for Qualifications, said: "Overall, outcomes are relatively unchanged." Girls continue to get better results than boys, with 79.7% of girls getting grades A* to C, compared with 75% for boys. But the gap between top-performing girls and boys at A-level has narrowed. And there has been a further decline in entries to modern languages, with the numbers taking French falling below 10,000 for the first time. Malcolm Trobe, leader of the ASCL head teachers' union, warned that this could reflect funding pressures and that schools could not afford subjects with small numbers of pupils. AS levels are being "decoupled" from being part of A-levels - and this year's figures show a 13.7% drop in entries. Teachers and head teachers' leaders have warned that, below the surface of this stability, individual schools and pupils face more unpredictable outcomes. "Students and their teachers are bracing themselves for greater volatility in this year's results," said Ms Keates, leader of the NASUWT teachers' union. She said that schools had to contend with new content in AS and A-levels. Head teachers' leader Russell Hobby forecast "significant variation" and unexpected results, behind the picture given by the national statistics. "For individual students, teachers and schools this is a real concern," said Mr Hobby. For those students who miss out on required grades for university, there are expected to be more opportunities available through the clearing system. This will include leading universities within the Russell Group, which have signalled that they expect to have places on offer. There is a demographic dip in the number of school leavers and the removal of any limit on student numbers in England means that universities could be competing to attract students to fill places. Middlesex University said this year would be a "buyer's market". London South Bank University is running a 36-hours non-stop clearing service, remaining open all night for inquiries from students. But students starting at England's universities in the autumn could face higher fees than the previous cap of £9,000 before they finish. Why do more girls go to university? Exeter University has announced that it is going to increase fees to £9,250 for current students and those beginning this year, as well as those starting in 2017. There will also be opportunities for those not going to university, with financial services firm PwC announcing that it has had a 20% increase in two years in recruiting directly from those leaving school with A-levels. A report from Barclays and the Centre for Economics and Business Research has argued that those entering apprenticeships after school could have much higher lifetime earnings than those going into graduate careers. And a study from the Social Market Foundation, also released on results day, shows that vocational qualifications are an increasingly common route into university, often in combination with A-levels. School standards minister Nick Gibb said: "We want to make our country a place where there is no limit on anyone's ambition or what they can achieve. "It is hugely encouraging that this year sees a record 424,000 applicants already securing a place at one of our world-class universities, with increasing numbers from disadvantaged backgrounds gaining a place as well. "